Do you love life in the Big Smoke? Perhaps your loved one popped the question in a gondola in the stunning ‘Floating City’, Venice? Or maybe you’re organising the biggest wedding of the decade to be held in New York city? Whatever your inspiration, the modern Skyline wedding invitation from Blush Stationery is perfect for those of you who want to make your favourite location a big part of your wedding! 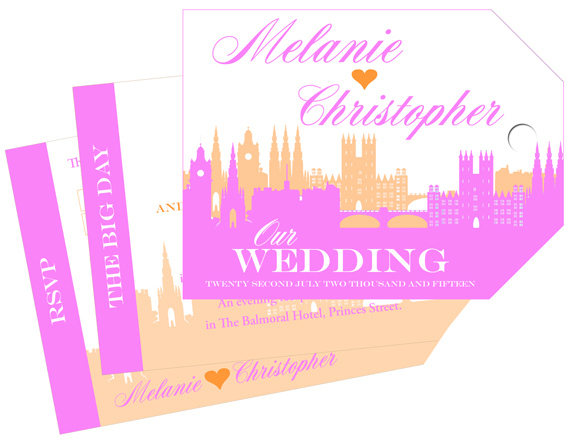 Designed in the style of a luggage tag, this invitation is ideal for destination weddings, elopements and city weddings on home soil alike! Are you heading off on a Scottish adventure to the historic city of Edinburgh? Is your wedding a small affair with a few close friends and family or are you going all out with bagpipes, kilts and haggis? Whichever it is, one thing is for sure, the Skyline wedding invitation will leave your guests excited and ready for an adventurous celebration! Depicting the most famous and prominent landmarks of your chosen location, the effect of the monotone skyline is both striking and modern whilst being easily recognisable. The freedom of colour choice means you can pick a colour that works perfectly with your venue and colour scheme. The font, sizing and layout is all decided by you for that all important personalised feel. So, despite your choice of location and whether you’re eloping or staying close to home, the timeless design of the Skyline invitation will no doubt be a winner amongst your guests. We think it would also double up as a super keepsake framed on the wall for years to come! Tags: Grey, Luggage Tags, Skyline, Travel.